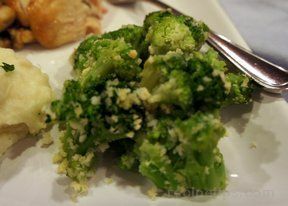 Crispy breadcrumbs add that little bit of crunch that goes so perfectly with the crisp yet tender broccoli. Seasoned with garlic, salt and pepper, you'll make this vegetable over and over again. 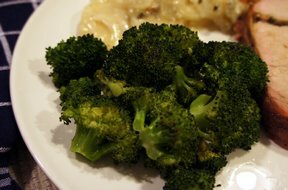 Cut broccoli into bite size pieces. 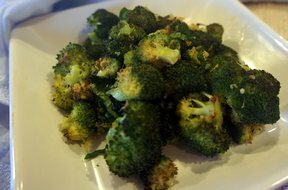 Place broccoli in a mixing bowl and toss with olive oil, garlic, salt and pepper. Set aside. Spread Panko bread crumbs into 9x13" metal cake pan. Place in oven for 2 minutes or until lightly toasted. Remove crumbs from oven and add to broccoli mixture. Toss to combine. 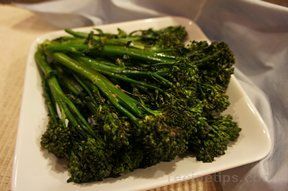 Return mixture to cake pan and place in oven, roasting until broccoli is tender, approximately 8-10 minutes. Remove from heat, toss with cheese and serve. "I loved how crispy the panko gets. Good simple vegetable recipe that will go with anything."